Korean boy band Super Junior will be coming back to the Philippines to hold their world tour in August. This has been confirmed by Happee Sy of Pulp Live Productions to Bulletin Entertainment via text message. Sy also announced on Twitter, May 22: "24 Days to CNBlue BlueMoon Tour Manila! Less than 100 days to SS5 Manila. Kpop friends, are you spazzing enough?" She also posted, "SS5 Philippines announcement soon! SS5 tip: if you will want to watch ss5, promise, ngayon palang start saving na or Baka d ka umabot #panicsaving." Super Junior held their last concert in the Philippines, Super Show 3, on Feb. 26, 2011 at the Araneta Coliseum. The Philippines was not included in the boy band's Super Show 4 tour last year. "It's either we do the ss5 on the given date to us, or bye bye again tayo like last year. So lunukin at tanggapin para magka Sapphire Blue Sea," Sy tweeted. 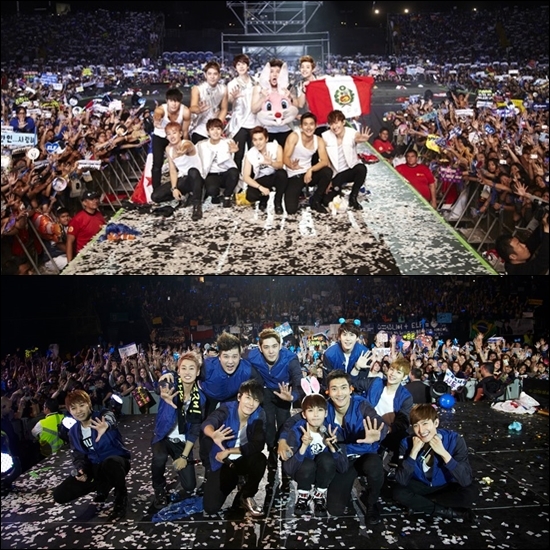 Super Junior kicked off their “Super Show 5” in Seoul last March. The boys then toured South America and held concerts in San Paulo, Brazil; Buenos Aires, Argentina; Santiago, Chile; and Lima, Peru last April. From June, Super Junior will hold the tour in Asia. Aside from the the boy band will hold concerts in Indonesia, Hong Kong, Singapore, Japan, Philippines, China and Malaysia. For the first time, Filipino fans will also see Kangin in the Manila tour. He was absent in the 2010 and 2011 Super Show concerts in the country. Joining Kangin in the Manila tour are Siwon, Donghae, Shindong, Sungmin, Eunhyuk, Ryeowook, Kyuhyun, Henry Lau and Zhou Mi. Other Super Junior members are currently serving in the army. They are leader Leeteuk, who enlisted in October 2012; Yesung, who performed at the Super Show 5 in Seoul in March and enlisted last May 6; and Heechul, who is scheduled to be discharged from the army by the end of August this year.